16th February 2019, a day Biafrans fortitude shall be put to test, a stepping stone their future begins either to remains in perpetual slavery in the hands of Hausa Fulani oligarchy and monopolize system or a free socialize system. Before comprehensive analysis on the indices to list election boycott and referendum, it’s pertinent to give the meaning of the above-mentioned phrase for better understanding; election boycott simply means deliberate abstinence, disenfranchisement or to withhold any kind of election participation. Furthermore, having no interest or involvement in politics. It’s called civil disobedience under United Nations Charter which Nigeria is a signatory to, is never a crime in any part of the world neither does it contravenes international law unlike, thesis by paid commentators flaunting online to deceive individuals with hypothetic logic that election boycott is not the best option to paralyze corrupt government. If not, then why is the government panicking if boycotting election is not the best option? In the simplest translation, election boycott is a sign of dissatisfaction of kidnapping system of government experiencing under the present government, illegitimate fraudulent electoral system. To drive home my reasoning Nigeria First Republic collapsed drastically after Obafemi Awolowo’s AG party call for the boycott. 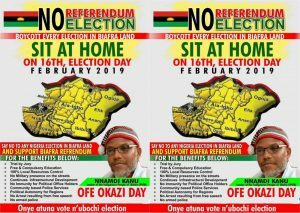 No doubt, it’s certain Igbo political harlots and Ohaneze Ndi Igbo led by Nnia Nwodo are working around poising the mind of Biafrans not to accept the necessity of election boycott. As simple as it is, the boycott program embark by IPOB is not new in contemporary political space, many nations have successfully experienced elections boycott quite unfortunate, dubious Nigeria government is running away from the truth facing them eye to eye. Kuwait election was successfully boycotted on November 30th, 2012, by Islamic Nationalist and Liberation Opposition Group against parliamentary election held under a new electoral law. With forensic attitude displaying by Nigeria politicians since a call for an election, the boycott has gone the mainstream, you will agree with me not voting can be a more effective option than voting logically placing politicians irrelevant in the society more than ever. On the other way round, an election is as useless as Nigeria politicians, since the inception of 1960 quack green and white flag independence what benefit has Biafrans get if not third-class citizenship, lopsided political appointment, and inequality in socio-political-economic system and many more? Politicians are afraid because the election boycott is a reflection of the entire clear will of the people to be free from the shackle of slave camp called Nigeria and her handlers. A country like Italy boycotted the election in 2012, making important decisions to be in the hands of people other than the government, the boycott shirking more responsibilities to Italians. A call for an election boycott by IPOB is a called safety; military clampdown against Biafrans is inevitable as Chief of Army Staff Burutai sported seen on live video reading out a targeted group of people to be sent to early grave during electioneering. It’s important to play safe at this critical time by abstaining from already rigged fraudulent fallout election than fall a victim was not necessary. Perhaps, it is noteworthy, Nigeria government to have it on her empty skull that terrorists do not vote, IPOB makes up the population in Biafra soil as IPOB terrorist proscription remains so shall election boycott stands probably, electoral materials can be transferred to Sambisa forest, Boko Haram terrorist enclave for them to voting as in Biafra it’s dead on arrival. By the way, I’m yet to have a clear rationale of Fulani Herdsmen seized fear since Miyyeti Allah endorsed their preferable candidates certainly, mass onslaught commences immediately after an election. This is to prove all and sundry these cabals deceiving gullible Nigerians to vote are the same people behind incessant killings by Fulani Herdsmen. A word they said is enough for the wise, can Biafra adhere to simple reasoning in order to have a sense of belonging as human by sitting at home on the day of the election? As noted early to give meaning on the bordering above questions, the word referendum might sound strange to some people to digest the meaning. In a nutshell, is nothing but direct popular vote on a particular proposal, another name for a referendum is a plebiscite, it’s old as democracy itself, having originated in the Swiss of Graubunden as early as the 16th century. Since then countless referendum has been held around the world, on June 24th, 2016 United Kingdom voted through a referendum to opt out from European Union (EU) likewise, 11 Feb 1961 plebiscite was held, Muslim-majority Northern area opted out for union with Nigeria and the Southern area voted to join Cameroon. Adamawa state was among the union that joins Nigeria, by implication this gives Atiku Abubarka constitutional right to contest political posts in Nigeria. Biafra can’t be exceptional what is good for Tom is also good for Harry, a call for referendum is never a call for war, the first phase for Biafra referendum is around the corner to determines Biafrans resoluteness for self-determination as international observers shall know how to prepare and serious the secession group is either in Nigeria politics or total freedom. So to say, the human being is naturally born free, now the dice has been thrown to make a choice is left for people concern to do justice on the samples collected, no doubt Biafrans shall give 100% by boycotting election invariably directly endorsing emerging new nation Biafra.